> IBM ILOG. 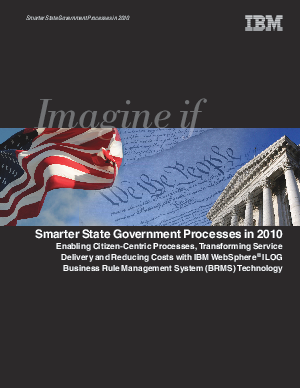 > Smarter State Government Processes in 2010 - Enabling Citizen-Centric Processes and more! White Paper Published By: IBM ILOG. Today states and government agencies must be able to respond and adapt quickly to relentless change to improve citizen and business services, manage resources effectively and efficiently, strengthen national security and public safety and ensure a sustainable environment. Find out how technology can enable the delivery of better value for citizens and lower costs in this solutions brief.